Earlier this year, I noted two DC Circuit decisions on compelled speech – disclaimer requirements around country of origin labeling (“COOL”) for meat and “conflict free” diamonds. In each case, the court struck down the labeling requirements, applying the “intermediate scrutiny” standard for commercial speech regulation. In a notable decision this week the DC Circuit, sitting en banc, reversed the COOL case. And in so doing, it explicitly overruled language in the “conflict diamond” decision applying the intermediate scrutiny standard. Why is this important? Because the court is saying that disclaimer and disclosure requirements are only subject to the lightest of constitutional burdens – the requirement that the compelled speech be “reasonably related” to the government’s interests and objectives. This is a very low bar (and to make matters worse, the court declined to even hold that the government’s interest must be substantial). The critical case at play is one I’ve written about before: Zauderer v. Office of Disciplinary Counsel. Zauderer isn’t as clear as it could be on this point, but most courts (including the two panels of the DC Circuit that first heard the COOL and conflict-free cases) have read it to apply the lower bar of “reasonably related” only to those cases where the compelled disclosure is necessary to prevent deception. The DC Circuit has now thrown the gates wide open, allowing virtual carte blanche forall manner of speech the government might want a business to disseminate. This bodes well for proponents of things like lawyer advertising disclaimers and GMO labeling requirements, but it is certainly a setback for free speech. Here’s hoping our very free-speech-friendly Supreme Courts steps in and clarifies that compelled speech, just like prohibitions on speech, should be carefully circumscribed. UPDATE: Jonathan Adler at the Volokh Conspiracy has a more in-depth look at the decision and the vexing issues it raises. What Do Lawyers Need to Know About NY’s Social Media Ethics Guidelines? That they shouldn’t be reading hand-wringing fluff like this recent piece in the National Law Review. Look, I realize not every attorney wants to be the test case for the constitutionality of their state’s attorney speech restrictions. But it would be nice if at least a few more attorneys stood up and advocated for their own First Amendment rights, rather than accepting at face value all of the restrictions the regulators try to foist on them. Read on for a more critical look at New York’s Social Media Ethics Guidelines. In a classic example of Eric Turkewitz’ famous aphorism, “outsource your marketing, outsource your ethics,” a North Carolina attorney has just been disciplined for a number of sloppily-worded claims on her website. The Grievance Committee of the North Carolina bar did not take kindly to attorney Stephanie Villaver’s “dog ate my homework” defense blaming her website designer. The fact that she may have tried to cover up her own inattention to the matter surely didn’t help things, either. A claim that cannot be factually substantiated. Implication that an attorney is a certified specialist. Again, it’s likely the case that the attorney’s evasive and non-responsive handling of this matter was the primary reason the Bar lowered the boom on her. Had she immediately corrected the website, there’s almost no chance she would have been disciplined. But the phrases in question – should they really form the basis of discipline? The first and the fourth are not “claims that can be factually substantiated” or “promises of results;” they are nothing more than the same vacuous puffery that every business that has given up employing any creativity in marketing uses in a half-hearted attempt to reach new customers. These are anything but effective advertising messages. But that’s also why they shouldn’t be regulated by the bar: they aren’t going to cause any consumer confusion. Every consumer knows how empty of meaning these terms are. I don’t feel that badly for an attorney who didn’t pay attention to her marketing and then failed to quickly address the problem. But I do wish the states would devote their enforcement resources to those engaging in real, consumer impacting abuses – and not those who simply resort to hackneyed marketing cliches. I was traveling in Scotland when this opinion came out last week, and it warms the cockles of my Scots-Irish heart to see more comeuppance for the state trying to tell us what to do. In Nat’l Assn. of Manufacturers v. SEC, the DC Circuit dispensed with the “conflict free” labeling requirement for diamonds. As the court rightly notes, the state only enjoys the easy-peasy “rational basis” standard of review when the compelled disclaimer is “reasonably related to the State’s interest in preventing deception of consumers.” Otherwise – like when it wants to send a political message or inform consumers about something or other – its requirement must meet intermediate or strict scrutiny. Back in the day, kids would have posters in their rooms of Michael Jordan, the photo taken through the transparent backboard, a tongue-lolling Jordan poised to deliver a monster jam over whatever hapless opponent happened to be in the way. MJ is long-retired, but he’s still “postering” opponents – just in a different kind of court. 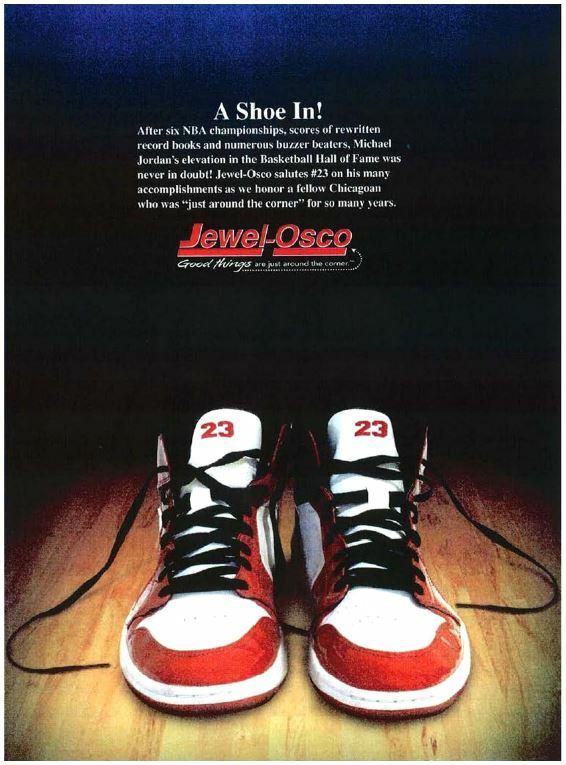 On the occasion of Jordan’s induction into the NBA Hall of Fame, Jewel Foods (a Chicagoland grocery chain) ran a congratulatory ad in a special edition of Sports Illustrated. Jordan took offense, and sued for $5M alleging publicity rights violations. While Jewel prevailed at the District Court level, the 7th Circuit reversed, finding the ad to be commercial speech. The opinion has a nice discussion of how the commercial speech doctrine works in edge cases like this. When I read the case, I thought perhaps the court had gotten it wrong. After all, not all advertising is commercial speech. It’s got to have an economic motive, promote a specific product and be in an advertising format. And this was just a nice ad congratulating a local legend, right? But then I saw the ad itself. Check, check, and check. Although Jordan’s suit does seem awfully mean-spirited and petty, it’s not hard to see why the 7th Circuit found it be “image advertising” subject to the commercial speech doctrine. Kevin’s right that use of text messages is tasteless and intrusive. And on a purely pragmatic level, it’s probably ineffective in most cases for the firms that use it, given the relatively non-commercial conventions of SMS usage. However, this doesn’t mean that solicitation by text message should be outlawed by the Bar. It’s long been established that the state can’t regulate advertising based on taste or the “dignity of the profession.” Bans on specific forms of solicitation have only been found constitutional when they involved the coercive presence of a trained advocate, in circumstances calling for a yes/no answer on the question of representation. That’s not the case with SMS; it’s a simple matter to just hit “delete” and think no more about it. The Bar requires that this disclaimer be included within the body of text messages, even if it requires several messages to do so. This interpretation wouldn’t (or at least, shouldn’t) survive a constitutional challenge, as it pretty much eliminates the ability to use text messages to communicate with accident victims. The Bar has the burden to show that its mandatory disclaimer is necessary and minimally restrictive; they’re unlikely to be able to do so here, given the lack of flexibility. Solicitation by text message is unseemly and distasteful, but taste can’t be regulated by the bar without offending the first amendment rights of lawyers to speak and consumers to have timely access to the information they need. Prohibition of speech is a blunt instrument. And while it’s easy to imagine scenarios where a text message would be unwelcome, it’s equally easy to imagine situations where consumers would be well-served by having timely information about their rights, even if these cases are few and far between. Ultimately, consumers are better served by relying on market and first amendment forces to discipline advertising tactics such as these. Update 12/24/13: Scott Greenfield has tried to take me to task on this one, but he’s missing the point – or letting his distaste for lawyer marketing blind him. Look at the Primus case. Look at the Shapero case. Two Supreme Court cases on bar rules prohibiting forms of written solicitation. Two cases applying the intermediate scrutiny standard of review for commercial speech. And two decisions overturning such restrictions, noting the fundamental difference between written and in-person solicitation. Do you think text messaging is “in person” or “real time?” You’d need to, in order to make the argument that Ohio could have arrived at any decision other than the one it did. Or you’d need to believe that Primus and Shapero need to be revisited.